This chapter is a synthesis of new knowledge, procedures, best practices and references for collecting plant diversity since the publication of the 1995 volume Collecting Plant Diversity; Technical Guidelines, edited by Luigi Guarino, V. Ramanatha Rao and Robert Reid, and published by CAB International on behalf of the International Plant Genetic Resources Institute (IPGRI) (now Bioversity International), the Food and Agriculture Organization of the United Nations (FAO), the World Conservation Union (IUCN) and the United Nations Environment Programme (UNEP). The original text for Chapter 26: Collecting Rhizobium, Frankia and Mycorrhizal Fungi, authored by R. A. Date, has been made available online courtesy of CABI. The 2011 update of the Technical Guidelines, edited by L. Guarino, V. Ramanatha Rao and E. Goldberg, has been made available courtesy of Bioversity International. Soil is the habitat of an array of microorganisms in all three taxonomic domains. Because many species of soil microorganisms are still unknown or non-described, the assessment of microbial diversity, especially the symbiotic bacteria and fungi is not feasible undertaking. In designing field sampling to collect symbiotic microorganisms, the challenge is to select a subset of the soil biota that adequately reflects the anticipated taxonomic spectrum, and which at the same time includes all the symbiotic microorganisms considered important. Designing a successful, practical sampling scheme is an art. In this chapter, we tried to provide a guideline to make it correctly ensuring the representative of all the indigenous symbiotic bacteria and fungi naturally present in the soils of sampled sites. As the majority of the microorganisms, including the symbiotic ones, are found in the upper 20cm of the soil profile, the main investigations have to be done on topsoil even if it doesn’t mean that microorganisms are not naturally present in deeper layers. Once the samples have been harvested, it is important to be cautious and store them nicely for further microbial analysis. Otherwise the risk to lose them or to get only contaminants after streaking is pretty high. This chapter describes some protocols and methodologies with practical and simple recommendations easily repeatable by people who have interest to make such laboratory work. We tried to raise the main steps ensuring the success of the establishment of the collection of symbiotic bacteria and fungi coming from all around the world. Symbioses between higher plants and bacteria or fungi are known to be important, and perhaps essential in some cases, for good plant growth. This is generally recognized to be due to improved nutrition of the host plant. In the case of the legumes for instance, the nitrogen nutrition of the plant relies on the symbiotic rhizobia that are able to fix nitrogen from the atmosphere through biological nitrogen fixation (BNF). BNF is one of the most important processes for the maintenance of life on earth, as it contributes about 70% of all nitrogen required by natural and agricultural ecosystems and is environmentally friendly. In Brazil, for example, inoculation with Bradyrhizobium strains has completely replaced the application of chemical fertilizers for soybean. In 2006, with a soybean yield of 57 million tuns, about US$ 3.3 billion in fertilizer expenses were saved because of this biotechnology (Moreira 2008). Satisfactory exploitation of new plant germplasm in new environments may depend on the natural presence of a suitable microsymbiont or its simultaneous introduction. Microsymbionts are widely distributed around the world, but that does not mean that all of them are compatible with different legumes and crops. Experience suggests that there is a close genetic association between host plant and microsymbiont (Sprent 2009). Thus, when plant germplasm is being collected for use in new environments, it is recommended that symbiotic microorganisms also be collected. It is very important to collect and identify microsymbionts coming from several agroecological zones (AEZ) in order to get those capable of forming an effective symbiosis with the targeted host plants. Many of the early studies of inoculation with a microsymbiont involved the transfer of soil from established crops, plantations and forests. Today, most microsymbionts can either be cultivated on artificial media or maintained as “enriched” cultures in association with an appropriate host nurse-plant in controlled conditions. Molecular tools can be used to confirm that they are still genetically correct and correspond to the initial microsymbionts. These cultures provide a good source of inoculum that can be introduced into the soil with the seeds at sowing, applied either separately or directly to the seed or seedlings. Some of the practical problems of collecting symbiotic microorganisms are outlined in this chapter as a guide to the collector of plant germplasm undertaking this work for the first time. The approach and methodologies described define principles and can be altered to suit individual requirements and facilities. Suitable isolates of the target microsymbiont may already be available. If potentially useful strains are not available, one must decide where to collect them. Prospecting for microsymbionts should concentrate on the same geographic and ecological areas from which the plant germplasm to be inoculated was collected. Edaphic factors are particularly important in identifying areas where suitable strains would most likely be found (Date et al. 1979; Molina and Trappe 1982). A perhaps more common situation, however, is for plant germplasm and microsymbiont collecting to occur in tandem. For example, a plant germplasm collector may also gather nodule samples and return them to a colleague in a microbiology department or institute for isolation of the microorganism. Joint collecting trips might be required when it is necessary to isolate organisms from fresh nodule or root material. Ideally, the microsymbiont and seeds should be collected from the same plant. However, this is often difficult, since seed collecting is often best done at times when the host plant has a reduced complement of active nodules or mycorrhiza. For example, nodules from annual legumes are best obtained from seedlings, although the nodule population in young plants may be composed of a suite of strains different from that of older (seed-producing) plants, as seasonal and soil conditions change (Caldwell and Weber 1970; Weber and Miller 1972; R.A. Date, unpublished data for strains of Bradyrhizobium forming nodules on Stylosanthes). Another example is Leucaena growing as a closed-canopy stand. It has been observed to have nodules at 98 days but not at 205 or 274 days; nodules reappear on the root system at 423 days (Wong et al. 1989). The presence of nodules on the root system in nitrogenfixing symbioses is often seasonally dependent, especially if soil nitrogen is at levels adequate for good plant growth. In long-lived perennial plants, for example, maximum seed set is often in the dry season, when nodules and fungi are not easily found. Sampling of soil and roots for ectomycorrhizal organisms is best done in the spring, when plants are actively growing. Young sporocarps are preferred for isolation but it is important to collect fully mature material for reliable identification of the species. Ectomycorrhizal numbers and sporocarp production also vary seasonally (Grand and Harvey 1982). Arrangements for the isolation and storage of the microsymbiont material should be made before setting out. When collecting abroad, it is essential to clear and coordinate microsymbiont collecting activities with the relevant local authorities, in the same way as it is done for plant germplasm. Microsymbionts are just as much a part of biodiversity as the plants on which they live. Material collected by a national programme in its own country may need to be isolated or stored abroad, if adequate facilities are not available locally, and the isolates re-imported as and when necessary. Quarantine clearance for the import and export of microsymbiont material may be necessary; this question should be investigated before setting out to collect. The sampling strategy is key to successful collecting. There is a long tradition of sampling in field ecology, and hence much experience has been accumulated. In addition, there is a well-established theory of sampling that applies anywhere it is attempted (Cochran 1977). There are numerous texts describing both theory and application (Gregoire and Valentine 2007). Huising et al. (2008) described some of the options for sampling for below-ground biodiversity, including microsymbionts, and they listed the advantages and disadvantages of different approaches. These authors suggested the use of sampling windows: a rectangular parcel of land that includes the range of locally significant land uses for study considered “representative” of the site. A regular grid (with variable spacing) is used to identify a set of possible sampling points within each window; the points correspond to the intersections of grid lines. The total number of sampling points per site is between 100 and 120 points. The distribution of microsymbionts may reflect landscape gradients (for example, those of soil organic carbon) and cultivation practices, or it might correlate with topography or vegetation patchiness or with soil resource gradients, or even with the location of the legumes. Spacing 200m between sampling points seems acceptable because it allows a relatively larger area to be covered by the grid and is more likely to reflect the most dominant land uses in the sample, while in most cases it is still possible to traverse from one point to the other. Soil microorganisms such as microsymbionts respond to seasonal changes, and their diversity (richness and abundance) will show marked differences between the seasons. With respect to arbuscular mycorrhizal fungi, for example, the dry season is more favourable for the production of spores than the rainy season, and those spores are also the best preserved. For ectomycorrhizal fungi, the structures and reproductive cycles (e.g., formation of sporocarps) have evolved to be in synchrony with seasonal changes, and the best time to collect them is towards the end of the rainy season. For rhizobia, legume species typical of the area should be selected for nodule sampling. Ideally, each sample of microsymbiont should be unique and originate from a single plant. It should also be associated with a single-plant seed sample, as symbiotic microorganism and host are often closely affiliated genetically. Experience has shown that 10 to 20 legume nodules per plant should be collected to adequately sample the variation in strain types in the nodule population. It is a good idea to collect two to five samples to represent a single site, as not all nodules will yield a viable culture and only a small proportion (as low as 5%) of the nodules may contain an effective nitrogen-fixing strain. Similar guidelines apply to collecting Frankia, VAM and ectomycorrhizal fungi. Usually, it is only necessary to process about half the sample, keeping the other half as a reserve against accidental loss during surface sterilization and isolation. It is important in collecting microsymbionts to know where to look on or about the root system for nodules, rhizomorphs and sporocarps. The location of nodules on the root system is very species-specific and is further influenced by local conditions. In small, strongly tap-rooted species like Trifolium semipilosum, nodules can be found within 4cm to 5cm of the root crown. In Stylosanthes, nodules are more or less equally distributed along the length of the root system to a depth of 15cm, but may be deeper in species like S. capitata growing in acid sandy soils (Venezuela) or oxisols (Brazil). Acacia and Casuarina species growing in free-draining deep sands have nodules at depths of 1m–2m, which is probably related to the level of the water table. Small herbaceous legumes (e.g., Trifolium semipilosum, Lotus spp.) can be sampled by digging a small core (diameter 10cm–15cm, depth 10cm) around the top root. For shrubs and trees, it is rarely necessary to excavate the entire root system. Careful removal of soil from around the root crown with a knife or small trowel usually provides good results. Most nodules are located on adventitious roots in the top 5cm of soil. For seedlings, a small core (as for herbaceous legumes) of soil around the root is usually adequate, but on mature plants, nodules may be found further out and much deeper, depending on conditions. Usually, it is possible to collect nodules from the cores by sequentially fragmenting the soil by hand, but it might be necessary with dry or clay soils to soak the core of soil in water and allow the soil to fall away. Alternatively, and especially in species where nodules become detached readily from fine adventitious roots (e.g., Macroptilium, Leucaena), soil and roots with nodules can be washed over a sieve (1mm–2mm openings). In either case, nodules can be recovered with forceps. 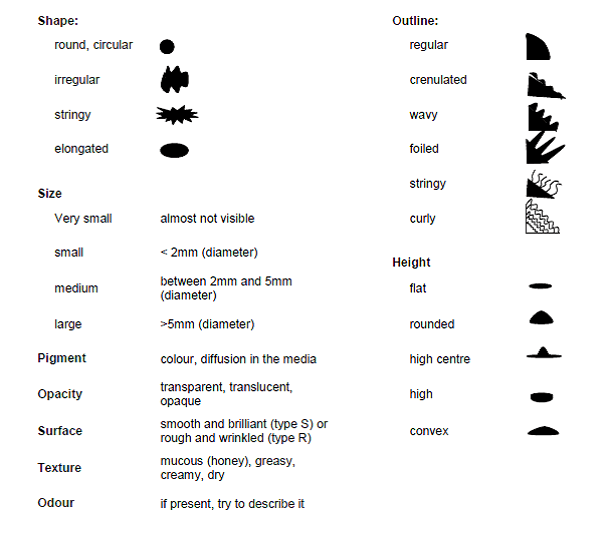 Nodule size and shape are also very species-specific. Those of Arachis and Stylosanthes are 1mm–2mm in diameter and firmly attached, whereas those of Alnus, Casuarina, Macroptilium and Medicago are typically larger and become detached readily. The shape of legume nodules is governed by the extent and location of the meristem. Hemispherical peripheral meristems produce spherical nodules, as typified by Arachis, Glycine, Lotus, Macroptilium, Stylosanthes and Vigna. Nodules on most non-leguminous plants are modified lateral roots with slow-growing meristems, usually branching dichotomously to give coralloid-type nodules up to 5cm–6 cm long, as typified by Alnus, Casuarina and Ceanothus (Becking 1977). Note: See Date and Halliday (1987) for details of portable kits if isolation of microsymbiont is to be attempted in the field. Microsymbionts can be isolated from nodules, roots or soils. For the rootnodule bacteria of legumes and for many actinorhizal organisms, the best source is obviously nodules obtained directly from the plant from which seeds are also being collected. When nodules are not available, collectors should sample a small piece of root and/or soil from near the root. For rhizobia, the conventional method is to use promiscuous trap species to isolate indigenous strains from soil samples collected in the field. These can be used to inoculate seedlings of the host plant growing aseptically in order to obtain fresh nodules, from which isolates can be made. However, this is a method of last resort, because it will not necessarily yield nodules of those strains that would have formed in the field. This could be significant, depending on the exact purpose for which nodules are being collected. If, for example, specific collecting is being carried out for a strain with the ability to nodulate a host at low soil pH or for a strain that is highly competitive for nodule formation in the presence of large populations of ineffective strains, then reproducing these conditions for aseptically growing seedlings might not be possible. However the use of multiple trap species is not usually feasible with a large number of sampling points because of the laborious nature of the procedure and the limits of time and laboratory facilities. Therefore, a single promiscuous trap species is employed. In these circumstances, Macroptilium atropurpureum is a good choice, as it has small seeds and is easy to manipulate under controlled conditions in plastic pouches and Leonard jars in a growth chamber or greenhouse. According to Moreira (2008), when multiple experiments are carried out, seeds from the same accession should be used because this will avoid any possible influence of plant accession on indigenous rhizobia trapped. Collecting soil and/or root pieces is the only way of obtaining material of those microsymbionts that do not form nodules or that cannot be grown easily in axenic culture (e.g., Glomus, VAM and some ectomycorrhizal organisms). In these cases, pure or enriched cultures may be obtained by collecting spores by a wet sieving method (e.g., Beaton et al. 1985; Gerdemann and Nicholson 1963; Hayman 1982; Molina and Palmer 1982). For arbuscular mycorrhizal fungi (AMF), the utilization of the most probable number method described by Bagyaraj and Stümer (2008) is relevant. It consists of estimating the number of infective propagules of AMF in several soils by making a series of tenfold soil dilutions where presence or absence of mycorrhizal colonization is recorded and results given as a probability of the number of infective propagules based on a statistical table. The advantage is that the analysis of trap host roots to check is fast and easy to carry out and can also provide AMF material for further isolation of spores. Spores are the only part of the fungal organism that can be used to start aseptic cultures (hair-root cultures infected with AMF can also be produced and disseminated as starter cultures for further larger inoculum production). Spores are extracted from the soil by wet sieving followed by sucrose gradient centrifugation (Bagyaraj and Stümer 2008). The viability of symbiotic bacteria and Frankia in the nodule sample is variable, and it is best to isolate on the day of collecting or soon thereafter. When this is not possible, nodules must be properly stored to ensure the viability of the cells they contained. Nodules are generally dried or kept frozen. The microsymbiont will usually remain viable in the dried state for several weeks, with 75% to 90% of the nodules yielding viable isolates after reimbibition and surface sterilization. Drying is best achieved by placing nodules in an airtight vial or screw-capped bottle with a desiccant such as anhydrous CaCl2 or silica gel (Date and Halliday 1987). Washing samples should be avoided, but, if it is necessary, then nodules should be dried with absorbent paper before being placed in the vial with desiccant. The desiccant can be kept in place by a plug of cotton or absorbent paper. Its volume should exceed that of the sample. A vial with a capacity of 10ml to 20ml, filled to 25% of its volume with desiccant and 10% made up of cotton or paper plug, is a good container for preserving and transporting samples. Vials should be kept cool. After the nodules are collected from the plant, thoroughly clean them through sieves and store them in a refrigerator at 4°C, awaiting sterilization for long-term storage. Fill McCartney bottles or any other autoclavable bottles with enough glycerol to submerge all the nodules. If McCartney bottles are used, pour in about 10ml of glycerol and autoclave for 20 minutes at 121°C. Autoclave for 20 minutes at 121°C: the sieves, at least five bowls and distilled water. Prepare calcium hypochlorite 3.3% solution (or use commercial bleach) and 70% ethanol. For sterilization, place the sieve into the bowl of sterile distilled water and pour the nodules onto the sieve to rinse off any dirt. Remove stones, leaves or any other waste. Place the sieve with the nodules onto the first bowl with calcium hypochlorite for one minute and transfer it to the next bowl for another minute. Finally, transfer the sieve to the last two bowls of sterile distilled water in order to rinse the nodules. Using sterilized forceps or spatula (sterilized with ethanol and fire), transfer the nodules to the storage bottles containing sterilized glycerol solution 20%. The nodules can then be stored at –20°C and below. It is important to remember that reagents have to be regularly changed after several washes. There are some species where the proportion of recovery is less than 5% of nodules and it is therefore necessary to isolate them from fresh nodules. For example, no viable isolates of Bradyrhizobium were obtained from more than 150 dried nodule samples of Stylosanthes capitata collected in Brazil and processed in Australia six to 10 weeks later, but isolation was 65% to 80% successful for fresh nodules processed the day of collection (R.A. Date, unpublished data). When isolations are to be made on the day of collection, the simplest method is to gather all or part of the root system into sealable polythene bags. On return to a laboratory, roots and nodules must be washed free of soil and the nodules excised with a short piece of root attached. Portable isolating kits are available and have been described by Date and Halliday (1987). Unlike nitrogen-fixing root nodules, sporocarps should be kept dry, but not airtight. Waxed paper containers are usually used (Molina and Palmer 1982). Put the nodules in a plate containing 70% ethanol for 30 seconds. Using sterilized forceps (sterilized with ethanol and a flame), transfer the nodules to a 3.3% Ca(OCl)2 solution for two minutes. After this step, the nodules are handled aseptically. Transfer the nodules to the subsequent plates in order to rinse them three times. Sterilize the forceps before every transfer. Under aseptic conditions, insert a nodule into a 1.5ml eppendorf tube. Add 200μl of sterile distilled water and crush the nodule using a sterile plastic pestle. If needed for further analysis of the microsymbiont, aliquot 50μl of nodule suspension into another eppendorf tube and add 50μl of 40% glycerol. Cover the cap with parafilm to prevent the tube from opening during storage and then store it at -20°C. This 50μl suspension can be used to isolate strains of rhizobia contained in the nodule. The rest of the nodule suspension is used for short-term analysis. If the analysis is not run immediately after crushing, tubes can be stored for a few days at 4°C. Microbiological culture is a method of multiplying microbial organisms by letting them reproduce in predetermined culture media under controlled laboratory conditions. In theory, from a single cell, a population composed of millions of identical cells (identical to the mother cell) can be obtained. In a liquid medium, bacteria diffuse throughout the liquid: the growth results in a turbulent appearance of the medium a few hours to a few days after incubation at optimized conditions. On a solid medium, bacteria are not able to diffuse. The mother cell divides and the cells formed stay close to each other, forming a mass called a colony. The following procedure describes how to cultivate bacteria in aseptic conditions, in accordance with good laboratory practice (GLP), from different kinds of samples, on a solid and/or liquid medium. Aseptic conditions/Aseptically: An aseptic environment is one where no microorganism is present. This can be obtained using a Bunsen burner (the aseptic zone is the spheric area around the flame with a diameter of approximately 15cm) or a laminar flow hood (sterile air is continuously produced and present in the hood; the difference in pressure between the inside and outside of the hood prevents the air outside from coming inside and contaminating the environment under the hood). Contaminated by microorganisms: Every plate, tube, pipette or other instrument (glassware, pestles, eppendorf tube, etc.) that has been in contact with microorganisms and which cannot be sterilized by the flame of a Bunsen burner is considered to be contaminated. Contaminated by toxic chemicals: Every tube, flask, pipette or other instrument (weighing boats, glassware, etc.) that has been in contact with toxic chemicals is considered to be contaminated. Good laboratory practice (GLP): The principles of GLP have been developed to promote the quality and validity of results and of the analysis conducted in a laboratory. It is a managerial concept covering the organization and the conditions under which laboratory studies are planned, performed, monitored, recorded and reported. Its principles also include the protection of humans and the environment. Mother tube/plate/product: This is the tube/plate/product from which the bacteria are picked. The result of the growth of this inoculation is considered to be the “daughter”, which can become the mother for the next inoculation. Plates or tubes of media have to be prepared a couple of days before analysis. The medium is composed of nutrients, agar (if solid) or water at a specific pH. The composition of the medium depends on the target bacteria to be cultivated – to either enhance or inhibit the growth of certain bacterial groups. Some specific additives (such as vitamins, antibiotics, etc.) might also be included to create a more specific medium. A solid medium is a gel matrix supporting the growth of many microorganisms, such as bacteria, fungi or yeasts. Liquid media are sometimes referred to as “broth” (e.g., nutrient broth). These are available for use in test tubes, bottles or flasks. In a liquid medium, bacteria grow uniformly, producing general turbidity. The composition is usually the same as for solid media in regard to the nutrients, but it does not contain any agar. The pH is also adjusted to provide good growth conditions. The medium is autoclaved for 20 minutes at 121oC. Solid media have to be poured (in aseptic conditions) into Petri plates while still hot and liquid. The agar will become solid as it cools. Plates are left to set at room temperature and then turned upside down until use in order to avoid condensation at the surface of the gel. Liquid media (in tubes, flasks, etc.) can be kept at room temperature. The rack with the tubes or the plates from which the bacteria will be picked is placed on the side near the burner, with the pipettes or the loop on the opposite side. The rest of the bench has to be clear. Other plates and tubes, which are not being used, can be placed on the side of the bench (or on a trolley next to the bench) as far as possible from the place where you are working. Again, plates should be placed upside down. Anything not useful has to be off of the bench. Usually, one plate is inoculated with one crushed nodule but several nodules from the same plant (or plants collected together) are analyzed and considered as replicates. All the plates and tubes have to be labelled before starting any manipulation. Note the date of the manipulation, the kind of sample you are using (name of the strain, origin, number of the sample, etc.) and any other information that might be useful. If many samples will not be incubated at the same temperature, also write the incubating temperature on the label. On the plates, write on the reverse side so that what is written can be read once the plate is incubated. The bacteria have to be picked up using a sterilized loop or pipette. To sterilize the loop, pass it horizontally through the blue flame (all of the metallic part), from the handle to the end (all the parts that might come in contact with the tube). Then put it vertically on the flame. The platinum loop has to become red hot. Let it cool down for a while before using it. If cottoned Pasteur pipettes are being used, break the end of the pipette (red mark) if needed and then sterilize the outside by passing it through the flame. Pass the pipette through the fire but not long enough for the glass to melt. Be careful not to contaminate the part that will be in contact with the tube by touching it with your hands. Open the cap slightly if it is closed tightly or remove the foil from the tube. If a solid culture is used as the mother, select an isolated colony (as large as possible) and note it with a marker pen at the back of the plate. If a liquid culture is used as the mother, homogenize the suspension using a vortex or by rotation, keeping it vertical. Ensure that no liquid touches the cap or the cotton. From liquid culture: Once the loop/pipette is sterilized, let it cool for a while so that it will not kill the bacteria in the samples. Keep the loop/pipette in one hand, and with the same hand, open the cap with your little finger. Keep the cap in this hand until the bacteria are picked. Never put the cap on the bench. Once the tube is open, pass it through the flame to sterilize the mouth. Be careful not to incline the tube too much: the suspension must not come in contact with the flame. Put the loop/pipette inside the liquid medium and remove it without touching the sides of the tube. Hold the pipette/loop horizontally so as not to drop the liquid on the bench or have it run into the top of the pipette (where the cotton wool is). Pass the mouth of the tube through the flame again, before closing it. (The cap should still be held with your little finger.) Be careful not to put the pipette/loop with the sample on it through the flame or the bacteria will die. Put the tube on the rack and inoculate the medium as described below. From solid media: Either a pipette or a loop can be used. Be careful not to break the end of the pipette. Sterilize the tool as described above, letting it cool so as not to kill the bacteria in the sample. Open the cap of the mother plate/tube and hold it in one hand. With the loop/pipette, pick the top of the selected isolated colony without touching the cap of the plate or the sides of the tube. Close the plate/tube and proceed to inoculate the medium as described below. From other products (soil, sand, commercial product, nodules, etc. ): Depending on the nature of the samples, the quantity to be picked is different. For solids, a suspension has to be made before inoculation. In most cases, 10g of product are diluted in 90ml of physiological water to get a representative quantity of the sample. Liquids can be inoculated as explained above for liquid culture but can also be diluted to make the sample more representative of the initial product: 10ml mixed in 90ml of physiological water. Shake well with a vortex or, preferably, put under agitation in a rotative incubator to get a better suspension of the bacteria contained in the initial product. Then proceed as described for a liquid culture. For nodules, crash the nodule in a small volume of distilled water with a sterile pestle and proceed as if it were a liquid suspension. Open the tube containing the sterile medium as explained above (using your little finger). Pass it through the flame and, while holding the cap, put the loop/pipette into the medium without touching the sides of the tube. Homogenize the medium with the loop/pipette, remove it, pass the tube through the flame and close the tube. To check on the purity of the liquid medium (by inoculation of a solid medium) inoculate directly onto the solid medium, then sterilize the loop as described above or put the pipette into a hypochlorite solution. Solid media on plates: Once inoculum is picked from the mother plate, open the daughter plate and hold the cap in one hand (the other hand holds the loop). There are many ways to streak: one can use any as long as isolated colonies are obtained after incubation. 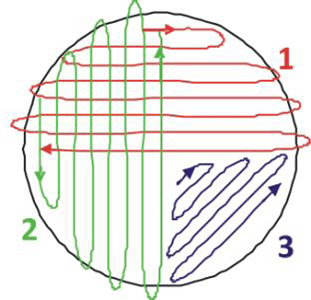 One example is explained below in detail (figure 26.1a), and sketches of others are also given (figure 26.1b). When finished, close the plate, turn it upside down and sterilize the loop as described above or put the pipette into a hypochlorite solution. Solid media in tubes: Open the tubes as described above and streak the slope of the gel. Try to make the lines as close as possible and avoid touching the sides of the tube. Put the plates into a box and then place the box in an incubator. Put the tubes in an incubator that is also an agitator if oxygen-dependant (aerobic) bacteria are expected to grow. Agitation optimizes the oxygen gradient. The temperature of incubation is set at the optimal growth temperature or at a selective temperature to allow the growth of the targeted bacteria and/or to avoid the growth of other microorganisms. The speed of the agitation depends on the volume and the needs of the bacteria. The optimal temperature for rhizobia is 28°C and a speed of 200 rpm is used for the liquids. The protocol, date of preparation, name and origin of the samples, name of the plates and any other relevant information are recorded in the lab book. The reagents are labeled with the name of the contents, date of preparation, name or initials of the person who prepared them and any other relevant information. Before inoculation, the plates of media are visually checked. Plates that are contaminated or wet are discarded. A database can be set up to monitor the plates over time. The plates are observed every day, at least once a day. A. Start to streak on one half on the plate: the lines have to be very close to each other (as close as possible). Then turn your plate by 90° and again streak one half. Finish in the last quarter, without touching the space you have already streaked. B. Other methods of streaking a plate. The rooms should be cleaned on a daily basis. Before starting and after manipulation, the hood and/or the bench are cleaned with a disinfectant and/or 70% ethanol. Any surface that has been contaminated (such as the bench, floor, user, etc.) has to be cleaned and disinfected before work can be continued. Non-contaminated or decontaminated items are cleaned with soap, rinsed with water and eventually rinsed with distilled water. In liquid media, the bacteria disperse freely and their growth leads to the turbulence of the medium. On solid media, the bacteria multiply on the surface of the gel and form clusters that are visible to the naked eye. These are called “colonies”. Observation of the colonies formed on solid media or the aspect of the tubes after growth can help to identify the bacteria. This procedure describes how to observe the different criteria which can be useful for the identification process. Observe the surface of the liquid medium: incline the tube gently and observe the presence of a floating piece of culture (as a disturbed area or a shadow) or a ring sticking to the tube sides. Observe the medium: presence or absence of turbulence, thick or faint, uniform or heterogeneous. Look at the bottom of the tube: presence or absence of a deposit; look at colour, texture, etc. After agitation: describe the turbulence and the deposit: sticky, homogeneous, heterogeneous, etc. Odour: Some bacteria have a specific door (such as Pseudomonas aeruginosa, which smells like honey). Open the tube in aseptic conditions (under the hood or near the Bunsen burner). Do not inhale too closely to the tube. It is essential to confirm that isolates are representative, pure cultures and able to form nodules (or infect a host root system) on aseptically growing host plants, and thus satisfy Koch’s postulates regarding causal organisms. Isolates must also be adequately preserved, evaluated and documented. Methods and criteria for this are described by Brockwell (1980), Date and Halliday (1987), FAO (1983), Moreira (2008) and Vincent (1970). Currently, the issues surrounding ownership of symbiotic bacteria and fungi are a nightmare. Private companies and even national collections have been working in the dark, and the final result is several references for the same strain of rhizobia or mycorrhiza. On the other hand, strains can be protected by specific patents, and according to the law, only the owners of the patents are legally allowed to use the strains. So far, for symbiotic bacteria and fungi, there are either no patents or they are not often patented. We believe that efforts are needed to clarify policies with regard to the collection and use of symbiotic bacteria so that poor farmers in developing countries will benefit. The supply chain of symbiotic microbial inoculants, their cost at the national level and their availability and quality at the local level need improvement. For example, why are rhizobial inoculants not widely used in Africa by farmers producing legumes such as soybean, bean or groundnut? There is one well-known success story: in Zimbabwe, farmers producing soybean automatically use rhizobial inoculant. This is the result of huge efforts to convince farmers about the importance of systematically inoculating legumes with both rhizobia and mycorrhiza and of inoculating crops with mycorrhiza alone. This has been successful because the government set up a factory where qualified people started producing good-quality, affordable peat inoculum. By making it available to farmers, the technology has been well adopted. Even in recent years, during the economic downturn in Zimbabwe, most of the farmers have managed to purchase peat inoculum for their soybean production. Hence, efforts for improved production, quality control and access by farmers need to be improved so that collecting is done better and the symbiotic microbes are better conserved. If there are improved benefits to be derived from a collection of symbiotic microorganisms, we need to identify the effective ones and see how to produce them on a large scale, in order to have good-quality inoculants available to farmers wherever they are. We know that there are technical issues in the production of mycorrhizal inoculants, for example, but even then, some existing systems are performing well with several AMF species such as Glomus intraradices. There needs to be a huge effort to fully exploit the high potential of microbes because they are still underutilized by poor end users. Interaction with the private sector seems to be the way forward in order to sustain the production of inoculants, but it requires industrial facilities with qualified people who know how to do it well. This sounds challenging but it is realistic because the market is huge and the demand is high. All that is needed is for everything to be organized and optimized. Sampling in the field needs to be correct in order to get representative soil samples corresponding to the existing indigenous symbiotic microbial communities. Storage of the samples (soils, roots, sporocarps, nodules) has to be done cautiously, and all this biological material requires immediate treatment, such as disinfection for nodules if the rhizobia contained therein need to be further isolated. Isolation of symbiotic bacteria and fungi is not very complicated but it has to be done in accordance with strict protocols; otherwise, the risk of isolating and cultivating contaminants is high. An example of this occurred some decades ago when different people were trying to isolate Frankia strains. They thought they were getting symbiotic strains of Frankia, but after inoculation to Casuarina seedlings, they did not get any nodules. Their stains were saprophytic Actinomyces, which is naturally present at the surface of the nodules, not symbiotic Frankia. While all these symbiotic microorganisms have to be tested under controlled conditions, they also have to be tested in the field in different agroecological zones. Then the effective inoculants have to be produced and provided to end users, which is the best way to justify collecting symbiotic microorganisms. Bagyaraj JD, Stümer SL. 2008. Arbuscular mycorrhizal fungi. In: Moreira FMS, Huising J, Bignell DE, editors. A Handbook of Tropical Soil Biology. Earthscan, London. pp.131–146. Beaton G, Pegler DN, Young TWK. 1985. Gasteroid Basidiomycota of Victoria State, Australia: 8–9. Kew Bulletin 40:827–842. Becking JH. 1977. Dinitrogen fixing associations in higher plants other than legumes. In: Hardy RWF, Silver W, editors. A Treatise on Dinitrogen Fixation. John Wiley & Sons, New York. pp.185–275. Bontemps C, Elliott G, Simon MF, Does Reis Junior FB, Gross E, Lauton RC, Elias Neto N, Loureiro MF, de Faria S, Sprent J, James EK, Young P. 2010. Burkholderia species are ancient symbionts of legumes. Molecular Ecology 19:44–52. Brockwell J. 1980. Experiments with crop and pasture legumes – principles and practice. In: Bergersen FJ, editor. Methods for Evaluating Biological Nitrogen Fixation. John Wiley & Sons, New York. pp.417–490. Caldwell BE, Weber DF. 1970. Distribution of Rhizobium japonicum serogroups in soybean nodules as affected by planting dates. Agronomy Journal 62:12–14. Chilvers GA, Pryor LD. 1965. The structure of eucalypt mycorrhizas. Australian Journal of Botany 13:245–259. Cochran WG. 1977. Sampling Techniques. 3rd edition. John Wiley & Sons, New York. Daniels BA, Skipper HD. 1982. Methods for the recovery and quantitative estimation of propagules from soil. In: Schenck NC, editor. Methods and Principles of Mycorrhizal Research. American Phytopathological Society, St. Paul, Minnesota. pp.29–35. Date RA, Halliday J. 1987. Collecting, isolation, cultivation and maintenance of rhizobia. In: Elkan GH, editor. Symbiotic Nitrogen Fixation Technology. Marcel Dekker, New York. pp.1–27. Date RA, Burt RL, Williams WT. 1979. Affinities between various Stylosanthes species as shown by rhizobial, soil pH and geographic relationships. AgroEcosystems 5:57–67. Dedeurwaerdere T, Iglesias M, Weiland S, Halewood M. 2009. The use and exchange of microbial genetic resources for food and agriculture. Commission on Genetic Resources for Food and Agriculture. Background Study Paper No. 46. Food and Agriculture Organization of the United Nations, Rome. Available online (accessed 12 October 2011): ftp://ftp.fao.org/docrep/fao/meeting/017/ak566e.pdf. Diem HG, Dommergues YR. 1983. The isolation of Frankia from nodules of Casuarina. Canadian Journal of Botany 61:2822–2825. Dommergues YR, Duhoux E, Diem HG. 1998. Les arbres fixateurs d’azote. Editions speciales. CIRAD-FAO-IRD, Montpellier, France. FAO. 1983. Technical Handbook on Symbiotic Nitrogen Fixation. Food and Agriculture Organization of the United Nations, Rome. Gerdemann JW, Nicholson TH. 1963. Spores of mycorrhizal Endogene extracted from soil by wet sieving and decanting. Transactions of British Mycological Society 46:235–244. Girlanda M, Perotto S, Bonfante P. 2007. Mycorrhizal fungi: their habitats and nutritional strategies. In: Kibicek CP, Druzhinina IS, editors. The Mycota: A Comprehensive Treatise on Fungi as Experimental Systems for Basic and Applied Research. Springer-Verlag, Berlin. pp.229–256. Grand LF, Harvey AE. 1982. Quantitative measurement of ectomycorrhizae on plant roots. In: Schenck NC, editor. Methods and Principles of Mycorrhizal Research. American Phytopathological Society, St. Paul, Minnesota. pp.157–164. Gregoire TG, Valentine HT. 2007. Sampling Strategies for Natural Resources and the Environment. Chapman and Hall/CRC Press, London. Habte M. 2006. The roles of arbuscular mycorrhizas in plant and soil health. In: Ball AS, Fernandes E, Herren H, Husson O, Laing M, Palm C, Pretty J, Sanchez P, Sanginga N, Thies J, editors. Biological Approaches to Sustainable Soil Systems. CRC Press, Boca Raton, Florida. pp.129–147. Hayman DS. 1982. Practical aspects of vesicular-arbuscular mycorrhiza. In: Subba Rao NS, editor. Advances in Agricultural Microbiology. Butterworths, London. pp.325–373. Huising J, Coe R, Cares J, Louzada JN, Zanetti R, Moreira FMS, Susilo FX, Konate S, van Noordwijk M, Huang SP. 2008. Sampling strategy and design to evaluate below-ground biodiversity. In: Moreira FMS, Huising J, Bignell DE, editors. A Handbook of Tropical Soil Biology. Earthscan, London. pp.17–42. Molina R, Palmer JG. 1982. Isolation, maintenance and pure culture manipulation of ectomycorrhizal fungi. In: Schenck NC, editor. Methods and Principles of Mycorrhizal Research. American Phytopathological Society, St. Paul, Minnesota. pp.115–129. Molina R, Trappe JM. 1982. Applied aspects of ectomycorrhizae. In: Subba Rao NS, editor. Advances in Agricultural Microbiology. Butterworths, London. pp.305–424. Moreira FMS. 2008. Nitrogen-fixing leguminosae-nodulating bacteria. In: Moreira FMS, Huising J, Bignell DE, editors. A Handbook of Tropical Soil Biology. Earthscan, London. pp.107–128. Singleton PW, Somasegaran P, Nakao P, Keyser HH, Hoben HJ, Ferguson PI. 1990. Applied BNF Technologies: A Practical Guide for Extension Specialists. NifTAL, University of Hawaii, Honolulu. Somasegaran P, Hoben HJ. 1985. Methods in Legume-Rhizobium Technology. NifTAL, University of Hawaii, Honolulu. Available online (accessed 10 October 2011): www.ctahr.hawaii.edu/bnf/Downloads/Training/Rhizobium%20technology/Title%20Page.PDF. Sprent JI. 2009. Legume Nodulation: A Global Perspective. Wiley-Blackwell, Oxford, UK. Stowers MD. 1987. Collection, isolation, cultivation and maintenance of Frankia. In: Elkan GH, editor. Symbiotic Nitrogen Fixation Technology. Marcel Dekker, New York. pp.29–53. Varma A. 2008. Mycorrhiza. Springer-Verlag, Berlin. Velasquez E, Garcia-Fraile P, Ramirez-Bahena MH, Rivas P, Martinez-Molina E. 2010. Bacteria involved in nitrogen-fixing legume symbiosis: current taxonomic perspective. In: Kan MS, Zaidi A, Musarrat J, editors. Microbes for Legume Improvement. Springer-Verlag, Vienna. pp.1–25. Vincent JM. 1970. A Manual for the Practical Study of Root-Nodule Bacteria. Blackwell Scientific Publications, Oxford, UK. Weber DF, Miller VL. 1972. Effect of soil temperature on Rhizobium japonicum serogroup distribution in soybeans. Agronomy Journal 64:796–798. Wong CC, Sundram J, Date RA, Rougbley RJ. 1989. Nodulation of Leucaena leucocephala in acid soils of peninsular Malaysia. Tropical Grasslands 23:171–178. The most comprehensive source of information on culture collections was published in 1972 by the World Data Center for Microorganisms (WDCM) (www.wfcc.info/wdcmdb). This is now the responsibility of the World Federation for Culture Collections (WFCC), which published the fourth edition of the World Directory of Collections of Cultures of Microorganisms in 1993 (Sugawara et al. 1993). This edition of the World Directory lists 481 culture collections, including services in 51 countries and the names of 334,312 strains of bacteria and 351,263 strains of fungi and yeasts. Information is indexed by geography, categories of holdings, main subjects and services like distribution, deposit, classification, identification, consultation and training, and personnel. Formed under the umbrella of the International Union of Biological Sciences (IUBS) and a federation within the International Union of Microbiological Societies (IUMS), the WFCC is the main international body coordinating the activities of culture collections around the world. Its aim is to promote and support the establishment of culture collections and related services; to provide liaison and to set up information networks between the collections and their users; to organize workshops and conferences, publications and newsletters; and to work to ensure the long-term perpetuation of important collections. The WDCM database includes Culture Collections Information (CCINFO), with a search facility that allows searches by collection name and by strain, and a network of international and national federations and organizations, such as the European Culture Collections’ Organisation (ECCO) (www.eccosite.org), the Japanese Society for Culture Collections (JSCC) (www.nbrc.nite.go.jp/jscc/idb/search) database and the UK Federation for Culture Collections (UKFCC) (www.ukfcc.org). Established to coordinate the activities of the UK national service collections of microbial organisms. Member collections offer a culture/cell supply service. Collection consists of actinomycetes, algae, animal cells, bacteria, cyanobacteria, filamentous fungi, nematodes, protozoa, mycoplasma, viruses and yeasts. Aims to improve, coordinate and validate microbial resource centre delivery to European and international researchers from both public and private sectors. Çaktu K, Turkoglu EA. 2011. Microbial culture collections: the essential resources for life. G.U. Journal of Science 24(2):175–180. Dedeurwaerdere T, Iglesias M, Weiland S, Halewood M. 2009. The Use and Exchange of Microbial Genetic Resources for Food and Agriculture. Background Study Paper No. 46. Food and Agriculture Organization of the United Nations, Rome. Available on-line (accessed 13 October 2011): ftp://ftp.fao.org/docrep/fao/meeting/017/ak566e.pdf. Krichevsky MI, Ross E, McManus C, Kirsop B. 1991. The microbial strain data network. Sydowia 43:123–134. Available on-line (accessed 13 October 2011): www.landesmuseum.at/pdf_frei_remote/Sydowia_43_0123-0134.pdf. National Research Council. 1993. Managing Global Genetic Resources: Agricultural Crop Issues and Policies. National Academy Press, Washington DC. Sugawara H, Ma J, Miyazaki S, Shimura J, Takishima Y. 1993. World Directory of Collections of Cultures of Microorganisms: Bacteria, Fungi and Yeasts. 4th edition. World Federation for Culture Collections, World Data Centre on Microorganisms. Wako-shi, Saitama, Japan.